AICP Fellows are nominated and selected by their peers to recognize and honor their outstanding contributions as professional planners. They are long-time members of AICP and have achieved excellence in professional practice, teaching, mentoring, research, community service and leadership. 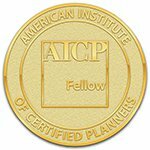 Planners who have been AICP members in good standing for at least 15 years are eligible to become Fellows. Nominations are accepted in the odd-numbered years with new Fellows inducted at the APA National Conference in the even-numbered years. Nominations can be made by the Chapter. For more information, contact NNECAPA's President. Sharon Murray is the Principal of Front Porch Community Planning & Design, with 30 years of planning practice both in the public and private sectors in Vermont. Her contributions to planning in Vermont, to the planning profession, have earned her the reputation as the credible expert in land use law and policy across Northern New England for both professional planners and lay audiences. David White has served as Burlington, Vermont’s Planning Director since 2007 after 12 years working as the city’s Comprehensive Planner. He has played a leading role in securing Burlington’s place as one of the most progressive, dynamic and livable small cities in the country. Dr. J. Michael Cobb has more than 30 years of international experience in planning, design, and management implementation of urban and regional development projects in the U.S. and overseas. He founded IDC International Development Consultants, LLC and previously was an executive with several major companies: Bechtel (Chief of Urban & Infrastructure Planning, global operations); Planning Research Corporation (Vice President); and EDAW (Director Urban Planning & Design). Brian Shupe has served as the Executive Director of the Vermont Natural Resources Council since 2008. Prior to that, he was a partner with Burnt Rock Associates in Community Planning. He has focused on natural resource protection, growth management and sustainable development throughout his more than 30 years of professional planning experience. Anna Breinich served as Director of Planning and Development in Brunswick, Maine from 2007 through 2017. Prior to that, she worked at the Pennsylvania Environmental Council where, as director of Community Planning and served as president of APA’s professional institute, the American Institute of Certified Planners. Alex Jaegerman is currently the Director of Planning & Development for the Town of Yarmouth, Maine. Until 2015, he was the Chief Planner in Portland, Maine, a position he held for more than 30 years. He holds a BA in Economics from Antioch College, a Master in City Planning from MIT School of Architecture and Planning, and was a Loeb Fellow in Advanced Environmental Studies at Harvard University Graduate School of Design. He is active on the Board of Directors of Portland Society for Architecture and Portland Trails.